javidi, N. (2013). Efficacy of emotionally-focused couples therapy (EFCT) to improve family functioning. International Journal of Behavioral Sciences, 7(2), 181-188.
nasirudin javidi. "Efficacy of emotionally-focused couples therapy (EFCT) to improve family functioning". 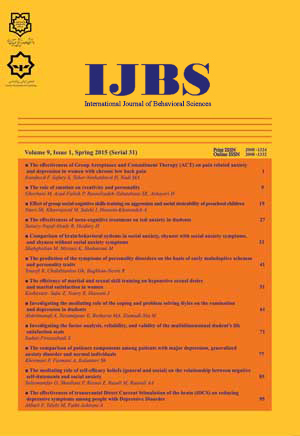 International Journal of Behavioral Sciences, 7, 2, 2013, 181-188.
javidi, N. (2013). 'Efficacy of emotionally-focused couples therapy (EFCT) to improve family functioning', International Journal of Behavioral Sciences, 7(2), pp. 181-188.
javidi, N. Efficacy of emotionally-focused couples therapy (EFCT) to improve family functioning. International Journal of Behavioral Sciences, 2013; 7(2): 181-188. Introduction: The aim of this study was to examine the efficacy of teaching emotion management strategies in improving family functioning of couples.Method: It was a quasi-experimental study with 60 participants (30 couples) who were selected using convenience sampling and were randomly assigned to control and treatment groups. All participants completed the Family Assessment Device (FAD) Inventory, and the treatment group underwent an eight session instructional program on emotion management strategies. In addition, couples’ age, educational degree, and length of marriage were checked. Data analysis was done using Covariance analysis.Results: The variables of Time and Group were found statistically significant. In other words, the results showed that teaching emotion management strategies could improve family functioning.Conclusion: The training program on how to manage emotions can play a significant role in improving family functioning in couples.